This site is the project of a group of Adrian Dominican artists creating work to support the ministerial efforts of the Adrian Dominican Sisters on behalf of the exiled Iraqi people driven from their homes by ISIS. 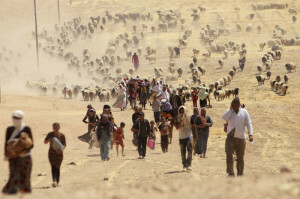 On August 6th, 2014, the fighters of the Islamic State expelled hundreds of thousands of Christians, Yazidis, Kurds and even Muslims from Mosul and the north of Iraq. The refugees were forced to flee with nothing, with no means of livelihood and even their human dignity. They now live in exile in the Kurdish territory, without safe shelter, adequate nutrition, potable water or basic health care. Our Iraqi Dominican Sisters, themselves displaced and without home or possessions, are trying to support and care for their fellow exiles. In our time, the tradition of the thousand cranes was rekindled through the story of Sadako Sasaki, a Japanese girl from Hiroshima. Sadako was two when she was exposed to radiation from the atomic bomb, and only twelve when she developed leukemia. She learned about the ancient story of the cranes, and began folding them, praying for health and world peace. Sadako died before she could finish 1,000 cranes, but her classmates, in honor of her life and efforts, finished the project. 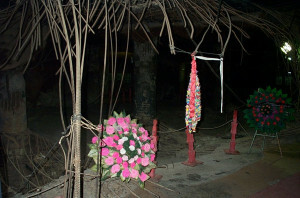 Sadako was buried with 1,000 cranes. Before the US invasion of Iraq in 2003, when the Iraqi people were suffering the effects of years of severe economic sanctions, US Dominicans organized Voices for Veritas as a response. Three delegations of Dominicans visited Iraq in successive summers from 1999 to 2001, as a witness of our solidarity with our Iraqi Dominican family and the people of Iraq. Visiting a bomb shelter in Baghdad, the Sisters and Friars were deeply touched to see a festoon of 1,000 multicolored origami cranes — a powerful and poignant symbol of the Iraqi peoples’ prayer for peace.